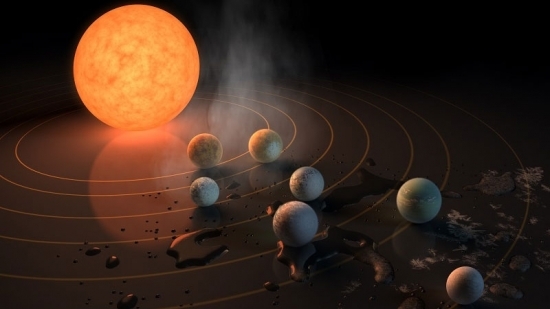 NASA and a team of Belgian astronomers announced on Wednesday that they have discovered 7 Earth-sized planets orbiting a single star. Those planets may also have the right conditions to support life. The seven planets orbit a star called Trappist-1 which is a cool dwarf star 40 light years away. The scientists estimate that they are solid, rocky planets and that surface temperatures are temperate, allowing for liquid water. The team from the University of Liege announced the discovery of three of these planets last May. The latest finding appear in the journal Nature. All seven of the planets orbit Trappist-1 at a distance less than our planet Mercury to the sun. However, the star is so cool that it would appear 200 times dimmer in the sky than our sun. The planets themselves are so close together that when a neighboring planet passes, it would appear twice the size of our moon in the sky. Their 'yearly' orbits are very fast, from 1.5 to 13 Earth days. Scientists will continue to study these planets. The makeup of their atmospheres and surfaces are particularly interesting and would determine habitability. A person was fatally struck by a Broad Street Line train in South Philadelphia this morning, shutting down service for hours. It happened around 7 a.m. at the Tasker-Morris station. Service was shut down between Walnut-Locust and AT&T Stations. Shuttle buses were running in place of trains along Broad Street. Service resumed around 10:15 a.m. The identity of the victim and the circumstances of the accident have not been released. Police are investigatigating. A Philadelphia man is now under arrest after making up a story about a child abduction after his car was stolen. 22-year-old Marcus Fletcher was working as a pizza delivery driver around 10:15 pm Monday night when he was carjacked by two armed men. Fletcher told police that his 4-year-old nephew was in still in the car. Police immediately began to look for the car and child. The vehicle was found but there was no child inside, promptly a frantic search that turned up nothing. After being interrogated, Fletcher admitted that there was never a child and that he made it up so that police would work harder to find his stolen car. He has been charged with making a false report.